Thirty years after her drugged body was discovered in her Hollywood home, the world is still speculating about the death of Marilyn Monroe. What happened in the last few hours of a warm August evening in 1962 to cause her death? Since she had a reputation wit friends for consuming large quantities of sleeping pills, an overdose seemed the obvious explanation. Probably suicide. She was in a highly nervous and desperate state in the last few months of her life and had been fired from her last, unfinished picture, aptly titled Something’s Got To Give. But as the years went by, there came revelations of her romantic involvement with President John F, Kennedy and with his brother Bobby, the Attorney General – revelations which, had they become public at the time, would surely have been career-shattering blows. 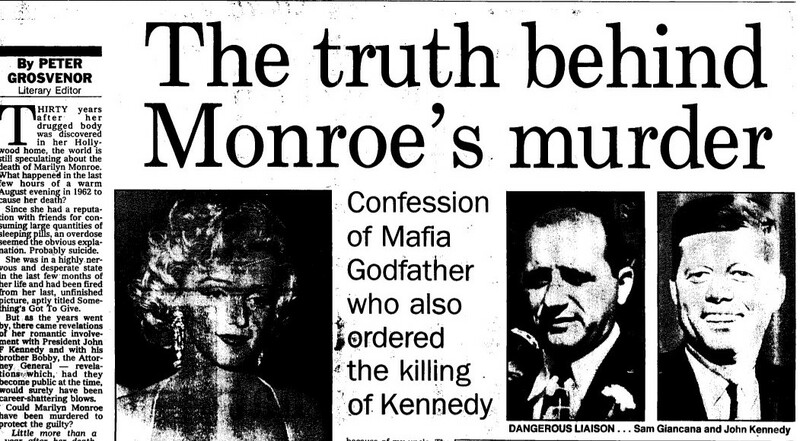 Could Marilyn Monroe have been murdered to protect the guilty? Little more than a year after her death, those fatal shots rang out in Dealey Plaza, Dallas. An now, thanks to Oliver Stone’s film, JFK, with its controversial assertion that Kennedy was assassinated by a CIA-Mafia conspiracy, there is renewed speculation about Kennedy’s death, too. On Monday, The Express starts serializing an important insight into both debates, a sensational book called Double Cross. It describes the Mafia involvement in the deaths, and it names the sinister figure behind them. He was the Chicago Godfather, Sam Giancana. And it reveals, for the first time, the virtually undetectable method chosen for Monroe’s murder. Giancana, nicknamed Mooney from his days as a crazy teenage henchman for Al Capone, later became one of the most publicized Mafia figures, renowned for his friendship with Sinatra and the Hollywood Rat Pack, and for sharing a mistress, Judy Campbell Exner, with President Kennedy. He made millions from drugs, gambling and prostitution. He was “the dregs of society, the worst kind of person,” said William Roemer, the FBI agent who shadowed him. Then on June night in 1975, in the basement of his Chicago home, Sam Giancana died as he had lived. By the gun. The killer planted a .22 pistol into the base of his skull and fired. The he walked out and vanished. With Giancana’s death it seemed that a million secrets would be buried – his co-operation with the CIA in the attempts to kill Cuba’s Fidel Castro, his deal with Kennedy, whom he had helped make President in 1960 by rigging ballots, and his involvement in the deaths of JFK and MM. “But he did talk, and over the years he confided a lot before he died to my father, Chuck,: says Sam Giancana, 37, the Godfather’s nephew and godson, who is a Florida advertising executive, and as far from a Mafia illiterate as you could image. After a sextuple heart bypass, his 69-year old father told him: “I don’t know who much longer I have to live, but before I go, I want the truth to come out about my brother. With the ad of Sam’s wife, Bettina, they wrote Double Cross. Speaking quietly about his notorious uncle, Sam told me: “ I was 20 when he was shot, and after the shock came relief. We had all suffered too much because of my uncle. The name Giancana, which for years was seldom off the front pages, was a dirty word in Chicago. Chuck ran a motel for him which was a legitimate business. After that, he decided to start his own construction business. “But then the banks withdrew his mortgage, so he had to sell it at a loss,” says Sam. “Mu uncle refused to help my father with a loan and that was really the end of any closeness. “The worst news came a few months after Bobby Kennedy’s assassination in 1968 when people in the Mafia told Chuck, ‘Your brother did it again.’ It seemed clear he’d had a hand in that assassination, too. Ten years ago, says Sam, he would not have dared to write so frank a book as this. “ There were enough people around to be really angry. It would have been like point a gun at our heads. “Even today there are Mob people around with vested interest in keeping things under wraps, but I don’t think we are at risk now. At least I hope not.